DDR2 vs DDR3: which RAM should you buy? When it comes to PC components, newer is almost always better. But unlike processors or video cards, new PC memory technologies don't come along very often. Also known as random access memory or RAM for short, PC memory often remains relatively unchanged for several years. DDR2 memory, for instance, first appeared in 2004. But only in the last 12 months has DDR3 taken over as the mainstream memory type for most new PCs. If you factor in existing systems, DDR2 is still the dominant memory technology. What's more, the benefits of new memory types aren't always clear cut. Back in 2004 when Intel introduced support for DDR2, AMD's Athlon processors remained the highest performing despite relying on plain old DDR memory. Put another way, you shouldn't choose a PC based purely or even mainly on the type of memory it uses. But just what are the pros and cons of DDR2 and DDR3? Is it desirable or even possible to upgrade from the former to the latter? The first thing to appreciate is that the two memory types are completely incompatible with each other. Everything from voltages to timings and signalling is different. Fortunately, they're physically incompatible, too. A repositioning of the slotted groove on DDR3 sticks and sockets means you can't accidentally insert the wrong memory into you motherboard. Of course, a change of physical form factor also means the minimum requirement for changing memory types is a new motherboard. However, you may need a new CPU, too. Some Intel CPUs for the LGA775 processor socket from the Core 2 era are compatible with both DDR2 and DDR3. Likewise AMD processors for the AM3 socket are DDR3 compliant and some will also drop into older AM2 boards and work happily with DDR2 memory. To find out whether you can hold onto your processor, check the product information at www.amd.com and www.intel.com. The most obvious reason to upgrade to DDR3 is speed. Where DDR2's effective frequencies officially span 400MHz to 800MHz, DDR3 kicks off at 800MHz and extends all the way to 1,600MHz. It is possible to buy memory sticks that go beyond these official ranges. 1,066MHz DDR2, for example, was a popular frequency for performance PCs a few years ago. But broadly speaking, it's fair to say that DDR3 is twice as fast as DDR2. More speed, of course, means more bandwidth. And bandwidth tends to mean more CPU performance. After all, if a CPU is left twiddling its thumbs waiting for data to arrive from main memory, it's not going to get much work done. Indeed, bandwidth limitations are likely to become critical for future CPUs as more and more data hungry cores are added. Admittedly, the latest CPUs from both AMD and Intel have integrated memory controllers with at least two channels. Combined with DDR3 data rates, the result is plenty of bandwidth for anything up to and including the newest six-core chips. But as processors appear with eight and more cores, bandwidth will once again become a crunch point for PC performance. The other major difference between DDR2 and DDR3 is operating voltages. DDR3 continues the recent trend by reducing voltages once again. Where DDR memory typically runs at 2.5V, DDR2 is commonly 1.8V and DDR3 operates in the 1.3V to 1.6V range. As for the question of whether DDR3 makes for a tangibly quicker PC with today's processors, there's no easy answer. One complicating factor is that DDR3 has tardier latencies than DDR2 which can lead to slower performance in some scenarios. For the record, memory timings are usually quoted as four-entry specifications such as 7-7-7-20, each number referring to the number of cycles required for a certain memory operation. However, if the difficulty and expense of adding DDR3 support to most existing PCs and the limited performance improvement make for a dubious upgrade, one thing is for sure. 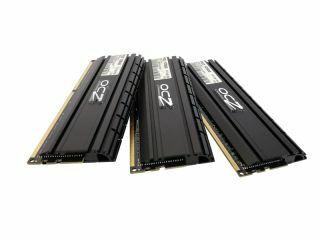 DDR3 support is a must for any new PC.